February 23rd, 2019 10:30 a.m. to 3:00 p.m.
Souvenirs, welcome package and more! Attendance limited to 80 participants so sign up early to avoid disappointment! 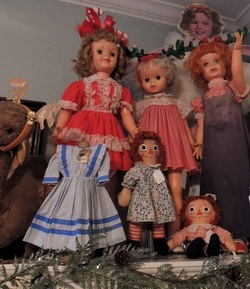 ​The Southwest Florida Antique Doll Study Guild is dedicated to supporting the United Federation of Doll Clubs Museum located in Kansas City, Missouri! Join us in the world's best doll salesroom!!! 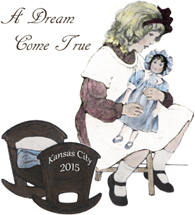 Bradley Justice and Billye Harris will be there for doll appraisals. Appraisals will be $5 each and all proceeds to benefit the UFDC Museum Collections. Stay tuned for more information about our 15th Annual Christmas Open House Event!!!! This is the "Do Not Miss" event of the year!!! Susan Sirkis and Bradley Justice will be appearing at this event too! And we would be remiss if we did not mention our namesake, The Ashley. Ashley is my favorite and priceless doll also known as my daughter. Beautiful suite-style doll show with some of the world's most trusted dealers. Buy your doll in a comfortable, private setting. 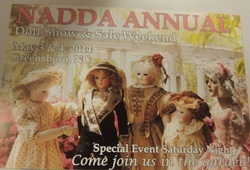 The show also offers two FREE doll seminars NADDA specialists. This is going to be a fun and informative doll weekend. A do not miss annual event! Une Journee de la Poupee 'A Day in the Life of a Doll"
Join us for an exciting experience sharing our passions for dolls with friends and family. Fun filled days of educational activities, superb salesroom, themed meal events and sightseeing opportunities. Be sure to visit our award winning sales booth in the UFDC Salesroom!!! 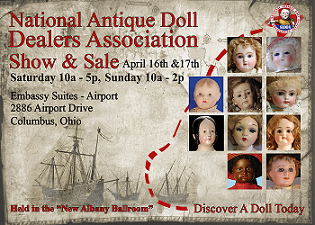 We will have a large collection of antique and vintage dolls on display!!! 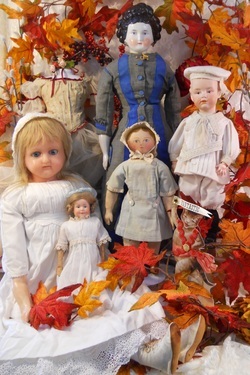 We will have antique, vintage, artist, contemporary dolls!! Doll clothing, toys, Steiff, wigs, shoes, laces, trims, fabrics, doll undergarments, doll parts, and so much more!!! Be sure to come visit us for a great party with food, drink, door prizes,and beautiful vintage Christmas decorations and trees!!! Drury Inn 1767 Glidewell Dr, Burlington, NC 27215 Phone: (336) 584-2004. Be sure to join us for one of the best vetted doll shows in the country! 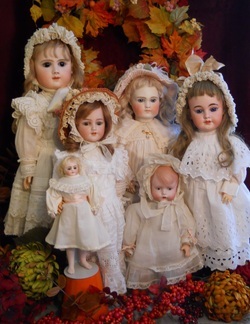 Wonderful antique and vintage dolls for every collector and every price point. Respected dealers from around the world with the finest dolls available! Save the date! Ballroom style sale with a room full of fabulous dolls!!! doll clothing, costume-making supplies, wigs, shoes, toys and more! doll undergarments, doll parts, and so much more!!! Many, many of these items are never shown on the internet or at shows!!! We are handicap accessible by request. AshleysDolls@gmail.com for requests. Be sure to join us for our Open House and Sale on Saturday, August 22nd, 10 am until 4 pm. We will have something for every collector!! Victorian home full of doll goodies and some outside tent space too! Super large sale with amazing amount of dolls and related items to choose!! Be sure to bring your family and friends. GREAT doll club outing too! Exit 138, I40/I85 Turn towards TA, go 7/10s mile. Ashley's Dolls is on the right. Join us for an exciting experience sharing our passions for dolls with friends and family. Fun filled days of educational activities, superb salesroom, themed meal events and sightseeing opportunities including tours of our UFDC headquarters and newly renovated museum. Be sure to visit our award winning sales booth in the UFDC Salesroom!!! 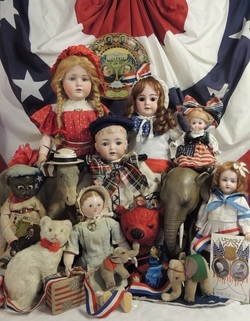 We will have a large collection of antique and vintage dolls on display!!! We are holding some extra special dolls, just for this show!!! 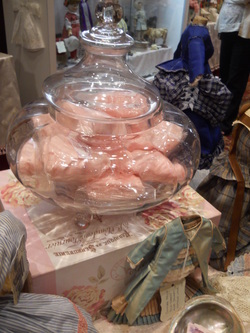 Our famous pink cotton candy will be available for all of our visitors!!! Come visit the Swell Doll shop at the Gibsonville Antique Mall on Saturday August 23rd for our Annual Doll Appraisal Fair. 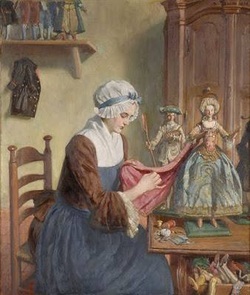 Bring your vintage or antique doll for evaluation. Bradley Justice of the Swell Doll Shop and Billye Harris of Ashley’s dolls will be on site to offer their expertise. Be sure to tune into Antiques Road Show’s upcoming season on UNC-TV to see Billye. Appraisals are $5.00 with all proceeds going to charity. Go to UFDC.org for more details! Fête de la Poupée, hosted by Les Rubans Aubergine Doll Club, from UFDC’s Region 16. Speakers will be from the international doll world, with programs in English and French. Paris Fête de la Poupée continues with a special exhibit room, open only to registrants of the Fête. 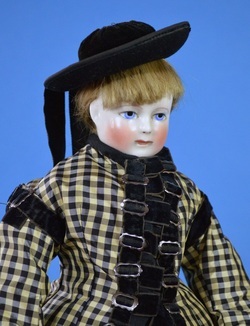 Doll dealers from America, France and Germany will be set up for your browsing and shopping pleasure including Ashleys Dolls and Antiquities. Info at: TLC Doll Tours: TLC Doll Tour Announced www.tlcdolltours.com Exclusive customized all-inclusive tours in Europe and the UK for collectors of antique dolls,toys and Christmas items. Fully escorted by an experienced guide and collector in business twenty years. 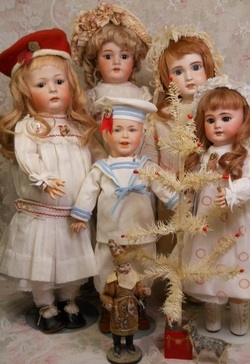 Many wonderful antique and vintage doll dealers with something for everyone. Two levels of dealers!!!! WE HAVE A FEW FREE TICKETS TO THIS EVENT. EMAIL US AT: ASHLEYSDOLLS@GMAIL.COM, IF YOU ARE INTERESTED. We will be in the UFDC Salesroom in booths 619/621. Be sure to stop by our booth and visit us! We will have many wonderful dolls, doll clothing & accessories, and much more!!! Mark your calendar now. A full complement of exciting programs, seminars, workshops, exhibits, salesroom, themed meal events and so much more await you. Visit the historic capital city of the United States, Washington, D.C., and look forward to having a capital time! Join Us for the Largest Doll Event of the Year! for all types of antiques at the event. All proceeds benefit the museum! 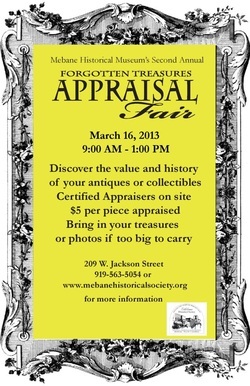 We will be at the appraisal fair appraising dolls. Be sure to bring your vintage and antique dolls. Great event for a very good cause. Wonderful museum facility in a delightful historical North Carolina town. There will be several experts in antiques, pottery, jewelry, furniture, military, coins, dolls, textiles and more! Dressel Uncle Sam doll and other antique dolls, vintage dolls and contemporary dolls being offered at Mebane Antique Auction in Mebane, NC. Event to be held on Monday, October 22, 2012 at 3:00 pm. Photos of some of the dolls may be viewed on Auctionzip.com or Mebaneauction.com. Come play dolls! Don't miss the Hidden Treasures Antique & Collectibles Appraisal Show! Saturday, November 3, 10am to noon Next to Kitchen Collection Is there hidden money in your attic? Experts are waiting to tell you how much your treasures are worth. Appraisers in the following categories will be on hand: American & Continental Furniture, Folk Art, Porcelain & China, Silver, Fine Art, Timepieces, NC Pottery, Linens, estate Jewelry, Crystal & Art Glass, Antique Railroad Items, Books & Papers, Lighting, Country Store Antiques, Weapons & Militaria, Rugs & Carpets, Antique Toys, Pocket Knives, Sporting Items, Quilts, Musical Items, and just about anything else you can think of! A special appraiser will be available for your antique radios, vintage Hi-Fi and stereo, antique radio tubes, and Western Electric made made items. Most items $5 per appraisal. Funds support our local NIE literacy program. The Burlington Times News Newspaper will being holding an antique appraisal fair on Saturday, November 3, 2012 at 10:00 am at the Burlington Outlet Center. We will be appraising dolls and there will be appraisers available for all types of antiques including art, military, coins, jewelry, furniture and more. All funds raised go to the newspaper's classroom charity. Come out with your dolls!